The Cabin of Peter I is a unique monument of Saint Petersburg's architecture. The cabin, which is the only wooden structure of the city foundation period that survived until nowadays, was constructed within a very short time — from 24 till 26 May, 1703. The cabin, made of hewn pine-tree logs and painted brick-like, was the first residence of Peter the Great in Saint Petersburg. The planning of the tsar residence was very simple. It consisted of a study and a dining-room separated with a hall and a bedroom. The inside fittings of the room were quite modest. The walls were covered with white linen. Peter I preferred small quarters, that's why the ceiling height was just 2,5 meter and the doors were even lower. Peter I periodically lived in his «palace» during his visits to Saint Petersburg underway. The house did not feature heating, so the tsar stayed in the cabin only during summers. On the roof of the house there were wooden carved mortars and bombs «with burning fire». Saint Petersburg climate damaged the log cabin, and in 1723 the tsar ordered to protect the house with a roofed gallery. 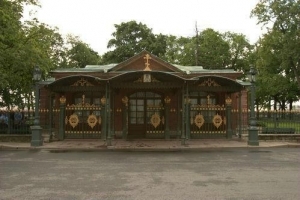 Many years passed, and in 1844 the cabin of Peter I was covered with a brick case designed by architect R. Kuzmin. At the end of the 19th century the garden in front of the palace was decorated with a bronze bust of Peter the Great sculptured by P. Zabello. In 1930 the historical and memorial museum The Cabin of Peter I was opened. During World War II the exhibits were evacuated or hidden within the city. The cabin itself suffered from bombing, but it was restored and opened to the public again in 1944. Nowadays the exposition of the Cabin consists of Peter the Great epoch's objects, as well as personal belongings of Saint Petersburg's founder and his close associates. The visitors to the Cabin of Peter I can see the tiled stove faced with Dutch tiles that dates back to Peter times, furniture pieces, prints, paintings by unknown Dutch artists, and applied art objects. The exposition also features the boat that was probably made by Peter I himself. In the museum one can find the materials concerning the Northern war as well. During the restoration works of 1971-1976 the masters reconstructed original paintings of the walls, doors and window panes. One of the most interesting exhibits in the museum is the plaster hand print of Peter the Great.